Although oxygen is a gas, it is most often stored as liquid oxygen because it is less bulky and cheaper to store than its gaseous equivalent. There are several safety considerations associated with liquid oxygen. The gas is stored at extremely cold temperatures, which can burn the skin if it is exposed to the gas. The extreme cold can also damage nearby materials, causing them to become brittle and shatter. Some materials will even combust in the presence of oxygen. These concerns, and more, necessitate safe storage and handling procedures for liquid oxygen. Transportation: Liquid oxygen containers must be handled carefully. Never roll the container. Always use a cart or dolly to move it and secure the container to the device with a strap to help protect it from falling off. Keep containers upright and properly labeled. Vessels. Oxygen of all kinds must be stored in vessels that are non-reactive with the gas and that have high ignition temperatures. Temperature. Liquid oxygen is so cold that even during the coldest days of winter, the air temperature is much warmer than the oxygen itself. Keeping liquid oxygen insulated from this nearby heat is essential. Containers should be able to withstand temperature and pressure changes and conform to national standards and codes. Location. Keep the containers in a well-ventilated area and protected from weather extremes. Do not store it near any flammable or combustible materials. Pressure Values. Do not tamper with container pressure relief devices, which are designed to control the internal pressure of the container by automatically venting. Ventilation: Liquid oxygen can cause materials to burn more quickly and ignite faster than they otherwise would. Even something as innocuous as spilling it on clothing can quickly become a disaster. Anything that has been exposed to liquid oxygen should remain in a well-ventilated area, away from any source of ignition, until the excess oxygen has fully evaporated. Smoking should never be permitted near open or closed containers or anywhere it is handled. In areas where liquid oxygen is used, there should be regular air changes – at least 6 per hour to ensure adequate ventilation. Any readings higher than 23.5% oxygen in the atmosphere are too high and considered dangerous by OSHA. Never leave liquid oxygen containers open to the atmosphere. Contact Josef Gas for the safe delivery and handling of liquid oxygen to your facility. Our team can even help you configure safe storage and handling procedures to protect your employees and your equipment. 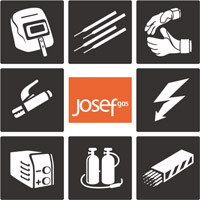 Contact us at 416-658-1212 or info@josefgases.com to learn more about our services.